For the complete history of the 037, the book "037" by Peter Collins is very advisable. On first appearance the 037 looks like a modified Montecarlo, but it is not! Designed for Group B rallying it was a very special and sophisticated car. Under pressure from Lancia Competition manager Cesare Fiorio, Fiat allowed Lancia to return to rallying in Group B for the1982 rally season with a new car designed by Abarth. The outline of the Group B rules for 1982 were finalized by the FISA ending December 1980 and required a minimum of 200 cars to be built during a 12 months period. In May 1980 Abarth's chief engineer Sergio Limone summarised his recommendations: a simple conventional 2 wheel-drive non-turbo car, based on an existing donor car. For getting the right image as a new Lancia rally weapon they choose the Beta Montecarlo as a donor. In July 1980 the sketches of project SE-037 were formalised and in September chassis 001 was under construction at Dallara. For this first prototype the cockpit of the last Gp.5 bodyshell was used. This first working prototype was, only six month later, running on December 24, 1980. 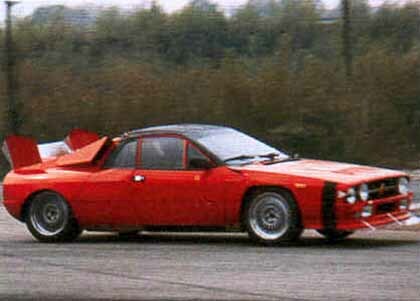 On December 14, 1981 Cesare Fiorio officially announced the new Group B rally weapon at the Fiat annual press conference - Abarth Project SE-037, known as Lancia Rally Abarth Martini. The new road version of the car, developed by close collaboration between Lancia, Abarth and Pininfarina, was finally unveiled on May 2, 1982 at the Turin International Motor Show. A stradale (ch.017): beautiful, aggressive, red, with a 2 litres, 16 valves, 4 cylinder, supercharged volumex compressor, 205 bhp. From the 200 cars to be build for homologation in Group B, 150 will be sold as stradales. 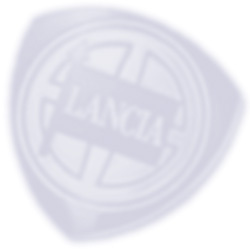 Engine: Ing. Aurelio Lampredi, Abarth president, was a believer in supercharching for rally cars, to get immediate acceleration. Fiorio and Tonti thought more of the turbo, but Lampredi had it his way (on the Delta S4 they later used both supercharching and a turbo). Abarth already had done a lot of testing with the Fiat 131 supercharged engine: in 1979 in the SE035 and in October 1979 fitted in a Group 5 Montecarlo for the Giro d'Italia. Engine building for the 200 cars started in December 1981. A 2 L, 16V twin cam super-charged for the Stradale with 205 bhp. 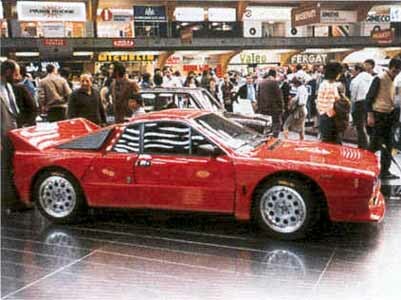 Chassis: The choice for the Lancia Montecarlo as a basis was also dictated by the lack of time to produce 200 road cars. It meant that the main passenger cell was Montecarlo, with a tube space-frame chassis attached at the front and rear to support suspension and engine. The front space-frames were fabricated by Abarth Cecomp, the rear by Marchesi in Modena. The Pininfarina plant, now running down the Montecarlo road car production, provided the 200 modified centre sections in July 1981 and assembled the space-frames to the monocoques in January 1982. The styling of the new car was by Pininfarina who had a difficult task due to the many dimensional constraints. At first they tried to modify a Montecarlo with widened front and rear, but later produced a stunning GT sporting body design. There also was a special double-glazing to reduce in-car noise. Suspension: The concept is long travel racing style double wishbones front and rear. The front was conventional double wishbone with helical springs over Bilstein dampers. The rear had a cast aluminum upright, double wishbones with toe-in control at the lower, twin dampers and springs between upright and chassis so no flex load on the dampers. Multiple chassis mounting points made it possible to change geometry. Production: From the beginning of 1982 production of the 200 cars started and all Lancia 037 Rally's were hand-built on a small special purpose assembly line at Borgo San Paolo in Turin. Pininfarina did the chassis completion and painting and built the cars less suspension and engine. The further completion production line was in the Via Caraglio in Turin, where the mechanical parts from Abarth were added. The 150 stradales had luxuriously trimmed interiors, comfortable seats, carpets and a full range of instruments; the competition cars were stripped out. Each 037 was tested and set up by Abarth's quality manager Giorgio Pianta and then ready for sale. There were 6 prototypes built; 1 car in 1980 and 5 cars in 1981. These cars were not to be part of the required 200 for homologation. 001: 9.1980 under construction at Dallara; first run 12.1980 at Campovola; 1.1981 test with 2L. supercharger and to Pininfarina wind tunnel; 4.1981 tested with turbo engine; initial testing done by Giorgio Pianta, Lancia's test driver. 002: 3.1981 from Marchesi in Modena; 7.1981 noise insulation work and vacuum servo assisted brakes; used for homologation. 003: 03.1981 from Marchesi to Pininfarina for production evaluation; 6.1981 used for creating the stradale version at Corso Marche and for noise emissions and braking improvements; 9.1981 appeared with the new bodyshell looking more like the later production model stradale. During 1983 it was used as 'Mazinga' (named after a cartoon monster) engine testing for the SE038 (the later Delta S4) with a hideous back-end. 005: 12.1981 in Martini livery for the press launch at La Mandria (not drivable); 2.1982 finally drivable, Martini tarmac car; this car was used as development car for the EVO1 homologation per August 1, 1982 and the number was changed to 302. 006: used for interior work and 7.1981 completed as first pre-production stradale. In July 1981 the final rally regulations for the 1982 season were published, so it was hard work to adept these in the production of the 200 cars. This was crucial, as after homologation only these parts were allowed for rally use. After the first homologation (per 1st April 1982) there were only Evolution versions allowed that required another 20 cars built each! A late addition to the first batch was in this case the huge rear spoiler that was delivered separate. Although the time from designing to the production of 200 cars was less than 2 years, it was a bit slowed up by the fact that Abarth was fully absorbed into the Fiat-group in June 1981. The 1982 season should be seen as a test for contesting the 1983 season with a perfect car to win the World Rally Championship. For 1982 Alen and Bettega would drive in the World Championship and Vudafieri in the Italian Championship. *** As to production totals it is possible that Lancia used some older, not sold, (renumbered) Stradales to get the EVO homologations and in reality only produced about 222 cars. Rally cars: Late February 1982 was the press presentation of the full 'gravel' Martini version (#005) that was now finally drivable and Markku Alen got his first drive at La Mandria in the new car. This was the first drivable corsa and used for testing and later on for development of the EVO1 per August 1, 1982. Another corsa, 036, soon followed. The rally version has 16" front and 18" rear wheels, the stradale 16" front and rear. The early rally version also still had a Weber carburetor. For homologation on April 1, 1982 a total of 207 cars were now built. The chassis destined for rally use were drawn from the stock and taken to the special production process. Now Lancia starts building 20 EVO1 cars for the FISA inspection end of July 1982. EVO2 was homologated on 1 January 1984. For the EVO1 some cars were also renumbered ( #302 = ex #005; #320 = ex #161; #318 = ex #176; #317 = ex #153 ). From early March 1982 the development was more focused on the corsa version. There was no time to get all the parts needed for a winning rally car incorporated in the production, but the ideas were there. A water injection system was tested to minimize leakage in the Roots compressor, pre-EVO1 cars were built and used as muletto and in standard form in the first rally. The 1982 rally debut was in the Costa Smeralda Rally in early April on Sardinia, a European Rally Championship round, with 2 cars for Alan and Bettega where both retired with gear selector problems.